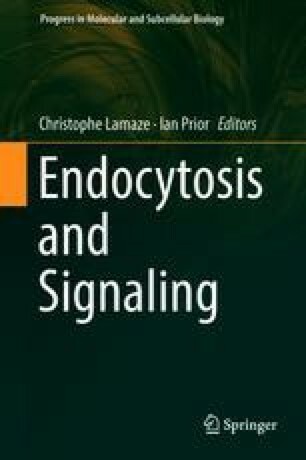 Endocytosis is key in a number of cell events. In particular, its role during cell division has been a challenging question: while early studies examined whether endocytosis occurs during cell division, recent works show that, during division, cells do perform endocytosis actively. More importantly, during asymmetric cell division, endocytic pathways also control Notch signaling: endocytic vesicles regulate the presence, at the plasma membrane, of receptors and ligands at different levels between the two-daughter cells. Both early and late endocytic compartments have been shown to exert key regulatory controls by up-regulating or down-regulating Notch signaling in those cells. This biased Notch signaling enable finally cell fate assignation and specification which play a central role in development and physiology. In this chapter, we cover a number of significant works on endosomal trafficking evincing the importance of endocytosis in Notch-mediated cell fate specification during development.